In addition to their announcement of the Kindle Fire HDX Amazon have launched a refresh of the Kindle HD. At a wallet friendly £119 this looks set to take on the Tesco Hudl in a battle to the death. that £119 will get you the 8gb model, whilst the 16gb will run you £139. The Kindle Fire HD has been redesigned to be thinner and lighter, with an HD display, dual speakers boasting Dolby Digital Plus technology and the latest version of the Fire OS, Mojito! Dual stereo speakers with Dolby Digital Plus audio — the standard in high-end audio. Powered by the latest version of Fire OS — Fire OS 3.0 “Mojito”— with hundreds of new and upgraded features, platform updates and Amazon-exclusive services. New features include expanded X-Ray for films and TV, Quiet Time, Quick Switch, and more. 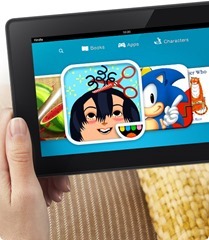 the way children use Kindle Fire — parents select content and set time limits by content type. Stay connected and productive with all-new e-mail, calendar and Silk web browser. Free, unlimited Cloud storage of all of your Amazon content, for downloading anytime, anywhere. Vast selection of content, including millions of films, TV shows, songs, apps, games, books, audiobooks and magazines.